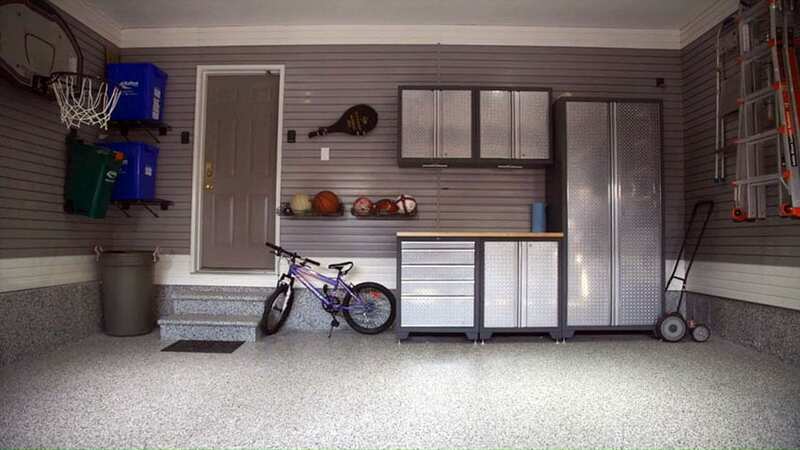 This gallery focuses on garage makeover ideas to help get more organized. Shelving, storage cabinets and hangers can help clean up clutter and be used to better store items. In addition, insulation, and epoxy & polyurethane flooring can be added to create a more comfortable, attractive and livable area. 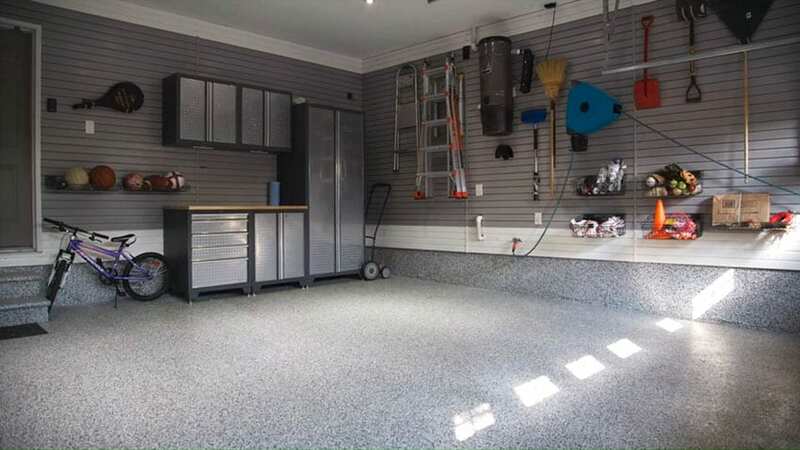 Below you’ll find before and after pictures that show effective ways to beautify and clean up your garage space. 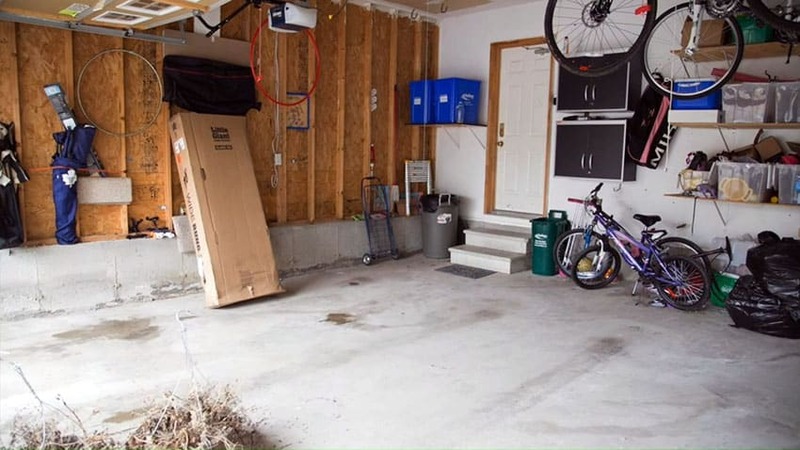 One part of the house people often tend to neglect is definitely the garage. It’s a place where we place old items, furniture, equipment, and other “dirty” items, making the area look like a dump than an actual garage. But keeping the garage clean and organized has benefits beyond aesthetics, and will definitely help make your life easier. 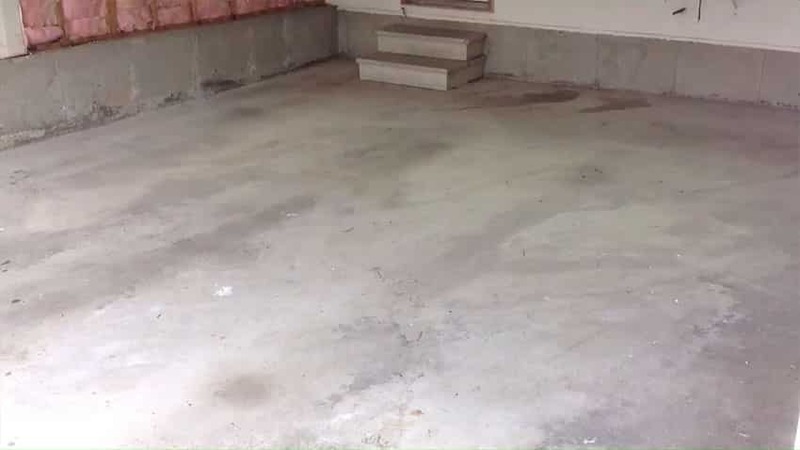 So what do we do to make our garage better? 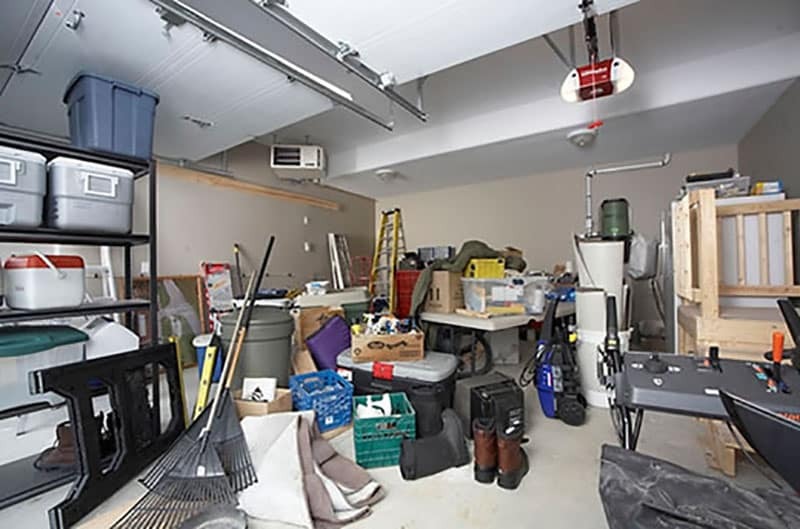 Storage Space – Discarded items, outdoor items, heavy equipment and the like will most probably end up in the garage. 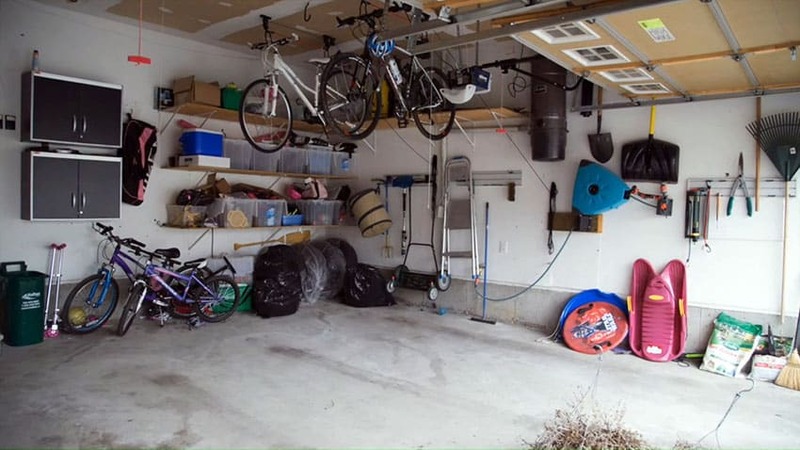 The best way to keep the area clean & organized is by dedicating garage storage spaces and shelves to keep things in place. Ceiling-mounted hooks & brackets – these are useful if you have enough ceiling room and are great for hanging and storing special equipment if you have them such as kayaks, paddles, bikes, etc. 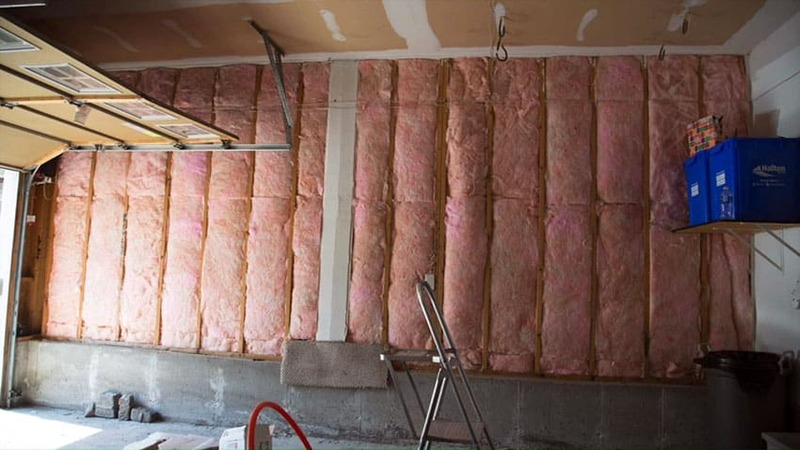 Insulation – garage insulation is often overlooked, especially when we don’t spend much time in the area. However, having a well-insulated garage will help keep the items and equipment stored inside in pristine condition. Improving the garage may not seem as fancy or as glamorous as the other parts of the home, but it will definitely improve the over-all ambiance of the house. 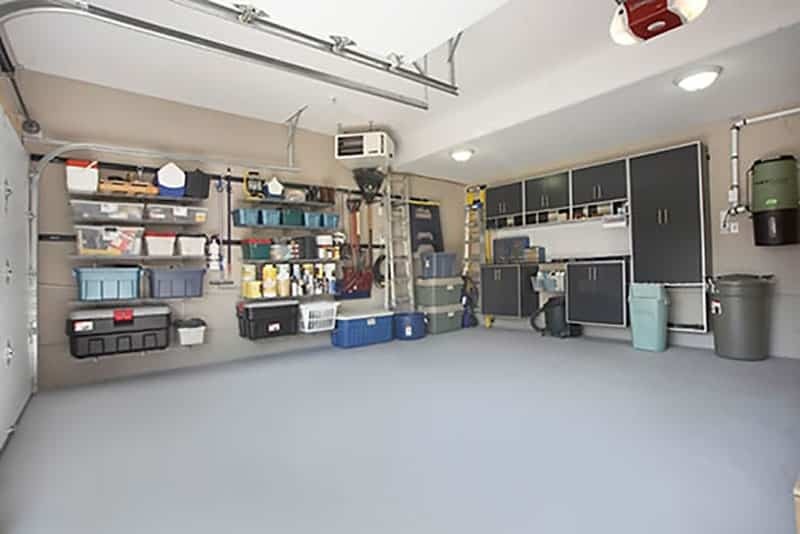 Simply adding appropriate storage in the garage already greatly improves the area. No more tripping over random wires or equipment, no more random falling items or hours spent on looking for the box of screws you keep in the garage. 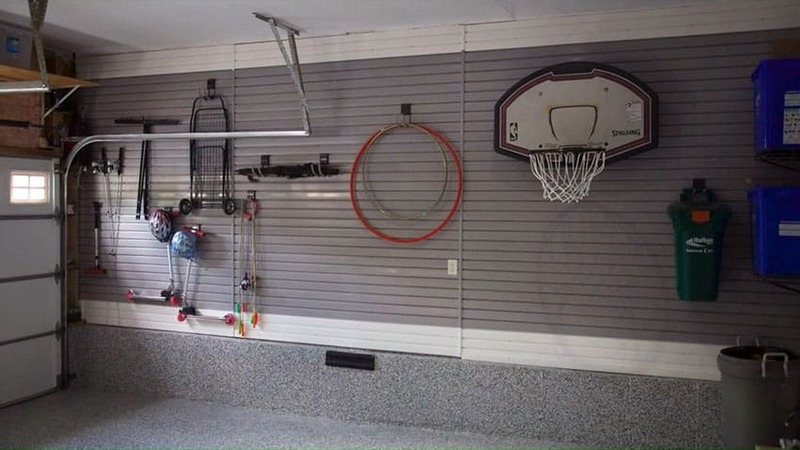 For even more ways to organize, check out our garage storage ideas guide. The first step is to create a list of problems with the space in order to come up with effective garage makeover ideas. it lacks proper insulation which can make the garage uncomfortable during hot or cold months. 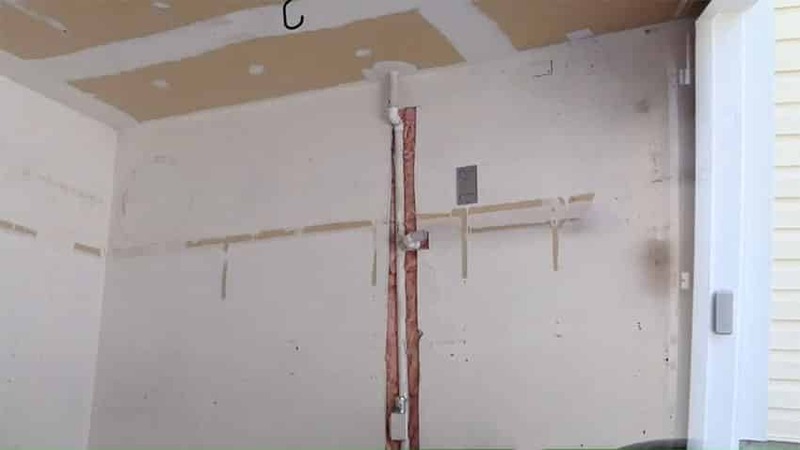 Insulation was added to the wall before it was boarded up for installation of PVC slatwall. This garage started with a bare concrete floor that is visually unappealing. For seamless flooring, the old concrete floors were replaced with a polyaspartic coating, creating a stain and scratch-resistant flooring surface. This type of floor coating is also resistant to chemicals of all sorts and cleans up well with water or regular detergent. The garage started with a bare sheet-rock wall that is both unappealing and non-functional for the homeowner. 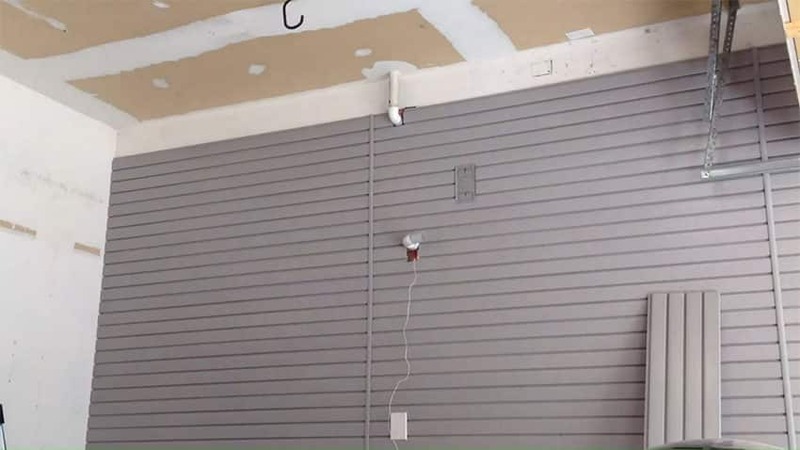 To solve the lack of storage space, a PVC slat wall was installed. You can hang shelves, baskets, hooks and other equipment on this wall, making it a very flexible storage solution. The slat wall definitely offers a flexible storage solution. You will see baskets, hooks, garden tools and equipment hung on the wall, keeping them out of the way, yet easily visible and accessible. 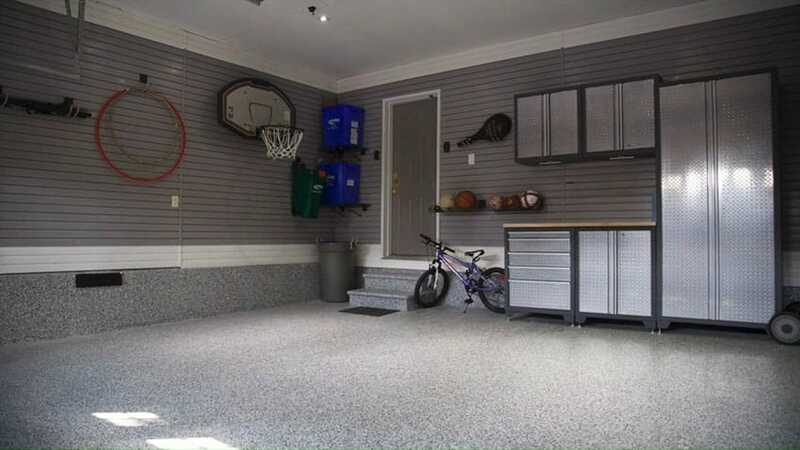 The polyaspartic floor coating gives a unique pebbled finish to the space, and also provides a heavy-duty floor surface for the garage. Using hooks, you can easily transform the slat wall and add more storage. You will see this side of the wall even installed a small basketball hoop/board, and also easily keeps strollers, scooters and other equipment. The finished product definitely looks cleaner and more organized. 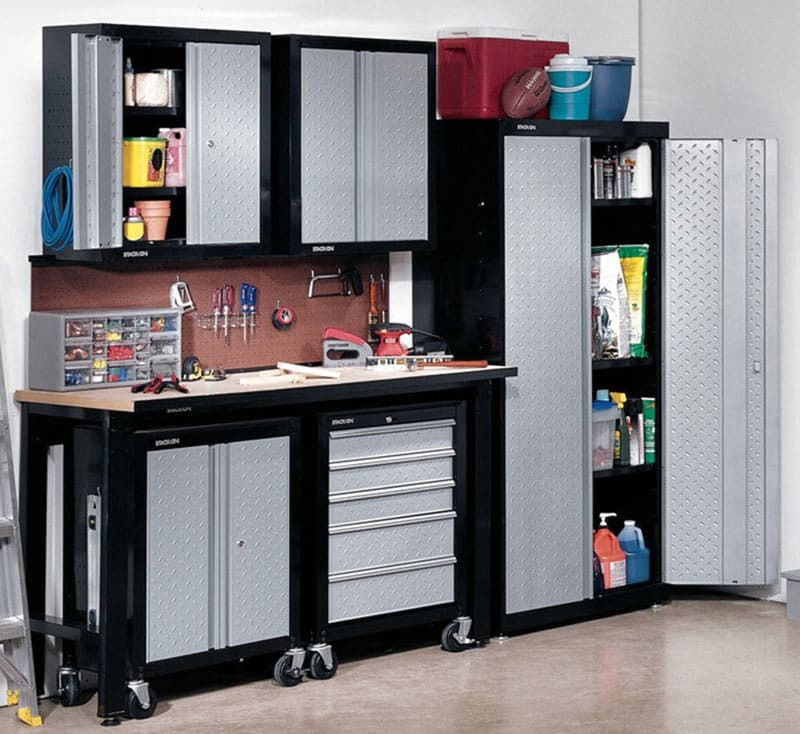 It also added garage storage cabinets made for heavy-duty / outdoor use. Instead of typical plywood or MDF carcass used in kitchens, the garage uses steel cabinets with textured metal cabinet doors to match with the rugged appeal of the space. 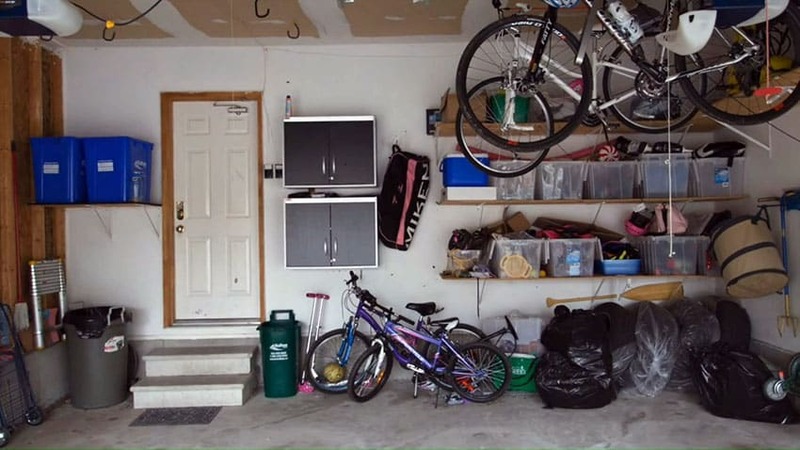 Here is another garage with a big problem with clutter and organization. Below we’ll outline some of the ways the homeowner cleaned up this space and got better organized. Again, storage is the main issue with this garage as it lacks appropriate cabinets and shelves to store items placed in the area. Compared to the previous example, however, it has better finishes so it is easily fixed. After installing storage cabinet units and shelving, the condition of the garage greatly improved. You now have a bigger open/work area, and it looks clean, uncluttered and very organized. Wall brackets were installed for the open shelf units, while the storage cabinets are all wall hung, keeping its base away from the floor and preventing exposure from moisture. This garage also used bare concrete for its flooring, with visible expansion bolts. 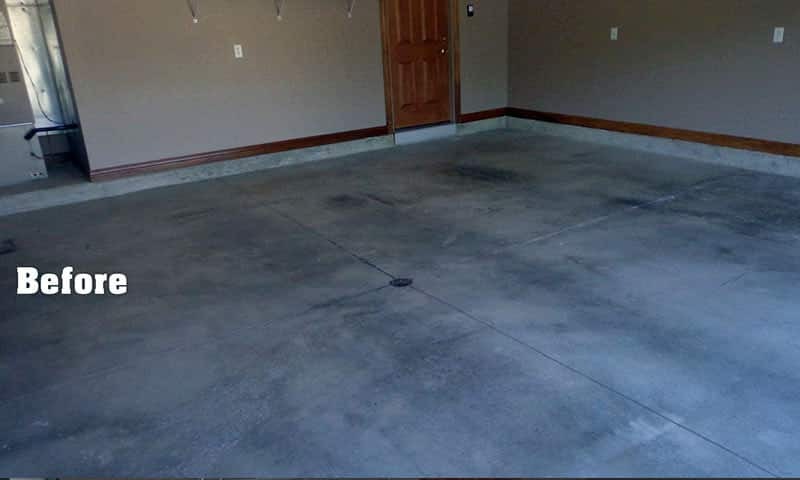 Although the finish is better than the previous example, bare concrete does not give enough protection from chemicals, stains, oils and other damages common on garage floors. 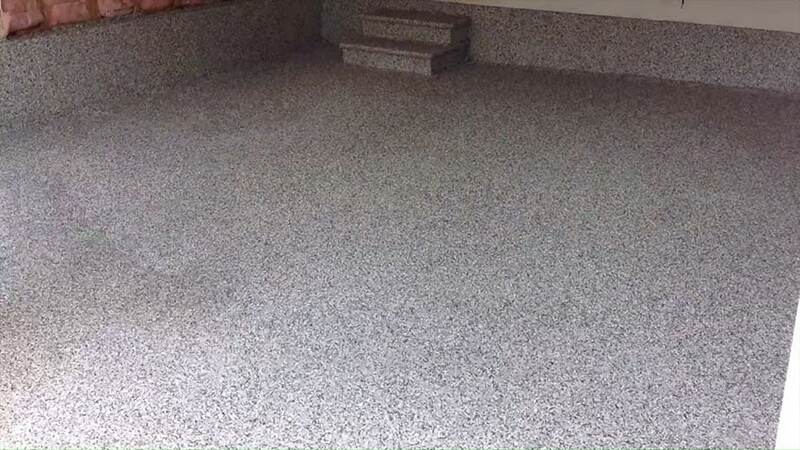 To keep the rugged appeal of the raw concrete floors, instead of completely changing the finish of the floor, it was simply coated with an epoxy coating. 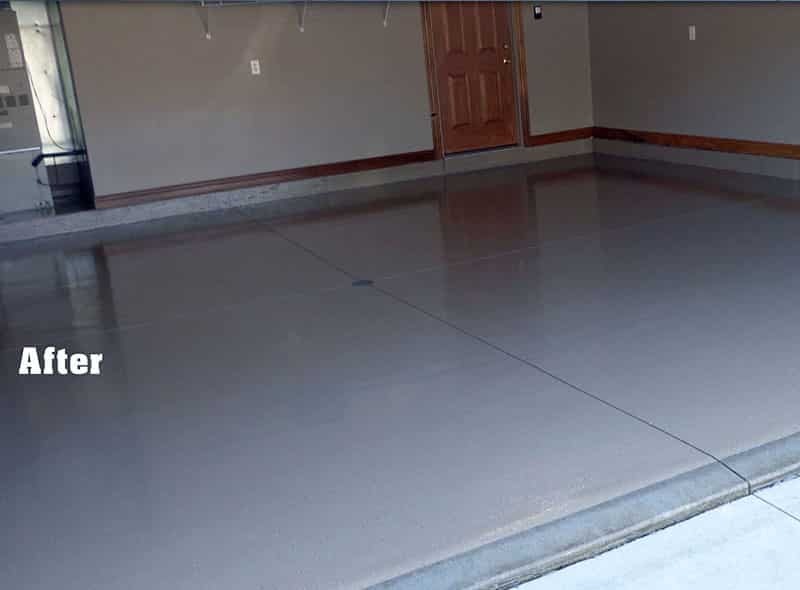 This is a great inexpensive option that would give your garage floor chemical, moisture and stain resistance, as well as create a highly durable finish in a variety of colors to choose from. Adding garage cabinets can be an effective way to de-clutter and allow you to quickly find items such as tools, cleaning products and garden supplies. Some garage cabinet units come equipped with a worktop to enable you to have a handy surface for completing DIY projects from your garage space. Similar to the steel cabinet used above, this is another great steel cabinet design. It has an all-steel carcass & textured sheet metal cabinet doors for that rugged appeal, with added mobility of wheels/casters, so you can move around the items in your garage as needed. Click here to get more information about these 6 piece metal storage cabinets. This is also an excellent variation of the cabinets featured above. The overhead cabinets can be attached on the slatwall for an adjustable height, has wheeled base cabinets and two large storage cabinets for storing cleaning agents and other equipment. It also features a wider wooden countertop for a more spacious work space. 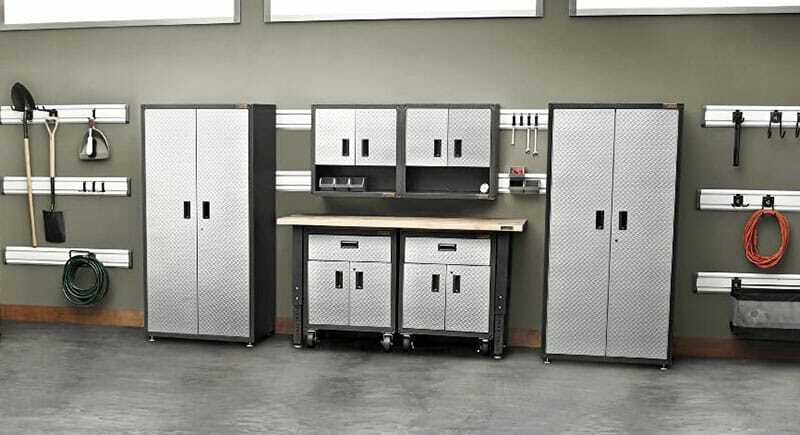 Click here to get more information about the industrial storage cabinet shown here. This page features “garage makeover” (Graham which is licensed under CC by: Creative Commons – Changes made include editing screenshots & adding music.